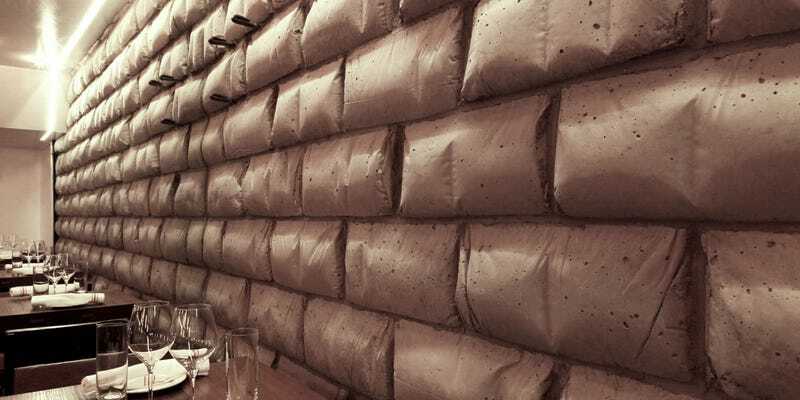 From afar, the walls at this Gowanus restaurant look like they're made from grey fabric—but they're actually made from concrete bricks poured into empty bags of flour from the resident bakery. Concrete masonry unit? More like cookie masonry unit! Sorry. Each block was made from an empty, 50-pound bag of King Arthur flour—emptied by the local baker—which were turned into two conventional formworks: One for "baguettes," the larger blocks, and one for "boules of brioche," which are brick-sized. At the building site, the designers at Latent Productions poured and cured 1,000 of the units (which, adorably, they call "belly blocks") to create a wall of bulging concrete along the length of the space.